Is that it for the Fall Severe Weather Season? October 23: 1 Texas tornado and a few hail reports. October 24: Several Texas tornadoes. One in Rice damaged several homes and businesses. Numerous hail reports. Youtube video of the Rice tornado. Youtube video from CNN of the Rice tornado. October 25: Not much of a chase day, but numerous high wind reports and two tornadoes reported. One in Illinois and one in Wisconsin. 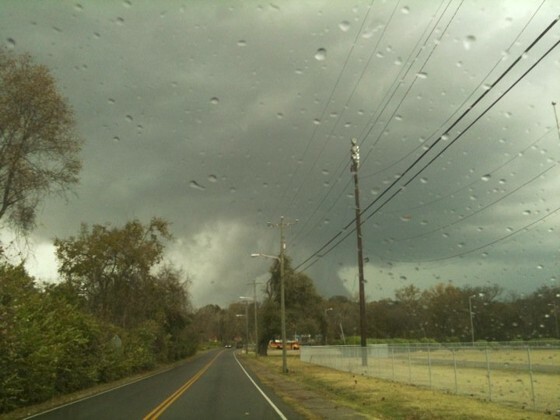 October 26: A major severe weather outbreak unfolded over the Ohio and Tennessee Valley. 52 tornado reports apear on the SPC reports page, with hundreds of high wind reports. Needless to say, this was a big event. October 27: Numerous tornadoes reported across North Carolina and Virginia. Now that the active period is over and we don’t have any severe storm setups lurking in the near future, you might start to wonder if that’s it for the Fall 2010 tornado season. It could be, but even November can sometimes bring a big event or two. A couple events come to mind. November 12, 2005 was a huge tornado outbreak in Iowa. In fact, I was chasing that day and shot video of the Gilbert, Iowa tornado! Another good event was November 10, 2002. That was a huge tornado outbreak in Ohio, Tennessee and Alabama. 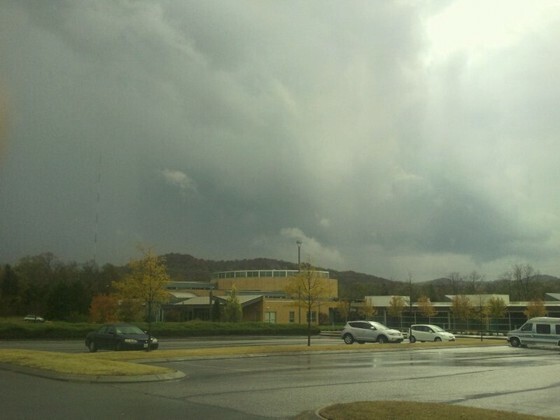 Wall cloud and RFD clear slot on a tornado warned supercell in Middle Tennessee October 26. Photo by Robert Nacarato. 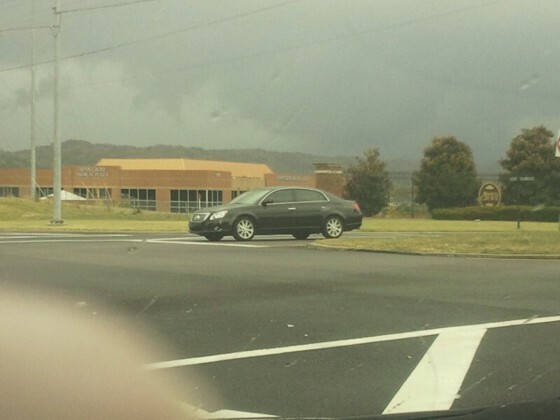 Wall cloud becoming rain wrapped on a tornado warned supercell in Middle Tennessee. Photo by Robert Nacarato. The back side of the flanking line. Photo by Robert Nacarato. Ominous clouds in middle Tennessee. Photo by Robert Nacarato. Tornadic supercells raced through middle Tennessee today, producing wall clouds, funnels and even at least one confirmed tornado. Robert Nacarato left his middle Tennessee home and drove south toward Williamson county to document a tornado warned supercell. He saw a wall cloud and said the clouds were moving so fast it was hard to keep up. 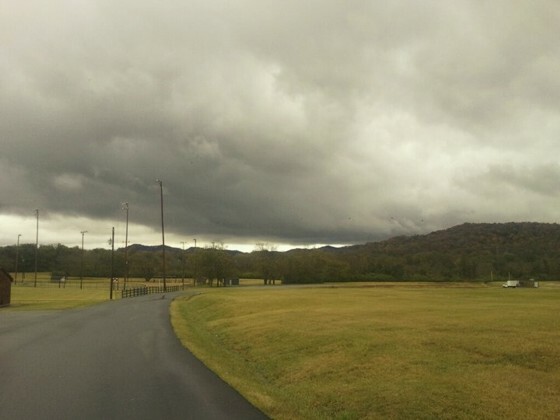 Storm chasing in middle Tennessee is quite a challenge with the hills and curvy roads. So Robert was lucky to see what he did considering storms were moving northeast at nearly 60 mph! Thank you Robert for your storm chasing photos! Storm Prediction Center issues a high risk for severe storms; damaging tornadoes are expected from the Tennessee Valley into the Ohio Valley…. An intense, rapidly moving storm system is bringing the threat for damaging straight line winds and violent tornadoes across the Ohio Valley today. A squall line is already in progress as I type over western Kentucky and Indiana, with individual storms within the line moving northeast at 60 mph. This line could produce tornadoes, but the main threat would be damaging winds. The big tornado threat is expected out ahead of the line from more discrete storms (supercells) that are expected to develop later this morning through midday into the very early afternoon. The combination of mid level winds (500mb) out of the southwest at 80 to 90 knots over a 65 knot 850mb jet from the south-southwest is creating an incredible wind shear environment for low topped supercells capable of producing violent, long track tornadoes. The only limiting factor is the weak instability, with CAPE values only expected to be in the 400-700 j/kg range. This is due to the relatively warm mid level temperatures. But, in situations like this where the 0-6km speed shear is so strong — combined with good directional shear — only 500 j/kg of CAPE is necessary to produce a long track, violent tornado from a low topped supercell. Setups like this are very difficult to forecast. The CAP may be a tad too strong for discrete supercells to form ahead of the squall line later today. If this is the case, the squall line will remain the dominant convective mode for the day, significantly limiting the tornado threat and boosting the straight line wind potential. But, if something can trigger storms to fire ahead of the line, tornadoes are likely to form. The degree of wind shear suggests violent, long track tornadoes are possible as well. (IMO, all you really need is one discrete supercell in this environment and it will probably produce many tornadoes, and at least one violent tornado). Unfortunately for storm chasers, these storms will be moving northeast between 60 and 80 mph!! Unless you plan on doing some serious speeding (not recommended!! ), you will not be able to keep up with these storms. The best advice I can give to any chasers out there today is to begin your chase in the northern area of your target and let storms come to you. As they pass by, drop south to the next one while still heading east as the storms race northeast. It’s more of a storm intercept type strategy, but it’s the only way a chaser stands a chance at seeing a tornado on a day like today. Good luck to anyone storm chasers out there! The setup is looking a little more promising. The WRF model now shows a well defined clear slot moving through the Texas panhandle and expanding through western Oklahoma in the afternoon. But the CAP will be somewhat limited, and upper forcing will be present throughout the day as a strong trough ejects through the southern Plains. As a result, severe storms will likely fire along the dryline across the Texas panhandle very early in the afternoon. Even in wake of the morning convection, enough instability should develop to support sustained supercells. But it will be interesting to see what kind of storm coverage occurs given the weak CAP. At any rate, shear will support a decent tornado threat. This could end up being a pretty good chase day if the CAP can hold off the afternoon dryline convection long enough Friday afternoon. The WRF and GFS models eject a strong shortwave into the southern Plains on Friday. The deep moisture already in place across south Texas (mentioned in a previous post) will advect north into Oklahoma by midday Friday. The combination of quality low level moisture and deep layer shear ahead of a dryline will support supercell development along with potentially a tornado threat across western Oklahoma and western north Texas on Friday, should adequate instability develop. 00z Oct 20 WRF 500mb heights/winds valid 00z Oct 23. 00z Oct 20 WRF 850mb winds/heights valid 00z Oct 23. The above images show the WRF model’s 500mb and 850mb charts, respectively. The left exit region of the 500mb jet (southwesterly flow around 45 knots) will move into western Oklahoma over a 30 knot 850mb jet out of the south. This will contribute to substantial wind shear, easily supportive of supercells. At the surface, a dryline is expected to mix rapidly east during the day from the Texas cap rock to the Texas/Oklahoma border or into parts of western Oklahoma. The issue will be the convection that occurs early in the day through midday across western north Texas and western Oklahoma. The WRF model suggests this convection will clear out in the afternoon and allow new convection to fire late in the afternoon or early evening along the dryline over the eastern Texas panhandle and move into western Oklahoma. But, it’s not clear if there will be enough time for adequate destabilization to occur to support sustained supercells and potential tornadoes. Certainly this is a setup to watch closely if you were hoping to see an October tornado! Severe Storm (Chase) Setups coming to the S. Plains Oct 22-28? It looks like two or three specific days are shaping up to be potential severe storm/chase setups across the southern Plains. I already wrote about the October 22 setup in western Oklahoma/Texas in a recent post. The European models show two intense shortwaves ejecting into the Plains early next week, presenting even more severe potential across the southern Plains. One shortwave moves into the Dakotas and Nebraska on Monday, developing a deep surface low over southwestern Kansas. Even if the model is anywhere close to verifying, that will be something to keep an eye on for a dryline supercell day anywhere from Oklahoma to Nebraska, especially considering the amount of energy coming from the Pacific. An active jet stream across the northern Pacific is expected to bring a series of strong troughs into the western U.S. this week into the weekend. Some of the shortwaves within these troughs will eject into the southern Plains as early as Friday and Saturday, but also into next week. 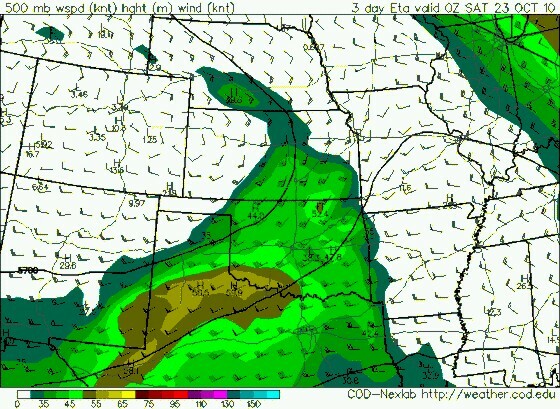 With quality low level moisture already in place across south Texas, only a couple days of solid moisture return could set the stage for severe storms across north Texas, Oklahoma and other areas over the southern Plains with each passing shortwave. 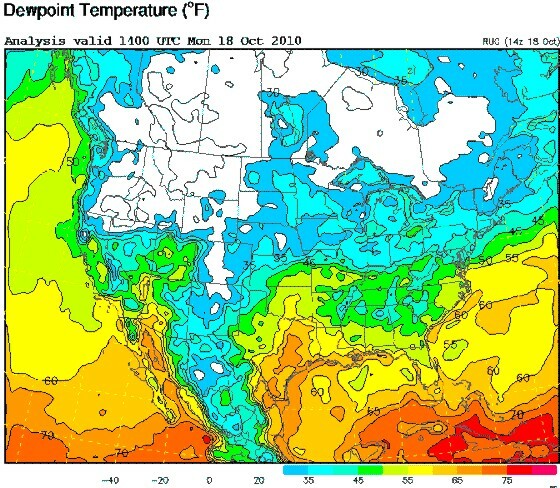 The graphic above shows there are already dewpoints in the mid 60s in place across south Texas, with plenty more moisture further south across the western Gulf of Mexico. 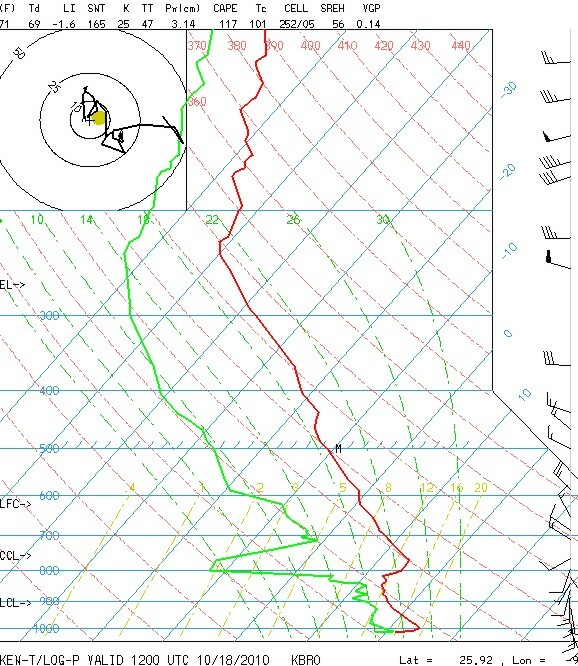 The image above is the sounding profile from Brownsville, TX. It clearly shows that the depth of the quality, low level moisture extends up to 800mb. All medium range models are forecasting a ridge to be centered over the Southeast this weekend into next week, with a deep trough over the western states. If you look at the individual runs of the GFS or European models, you will see that they show various shortwave troughs ejecting into the Plains. Some of these suggest promising severe storm setups, but each model run will show changes to these setups this far in advance. The point here isn’t to pick out the day or the area that these models show a chase setup now, because they will likely be wrong this far out. The point is to mention what we know. We know that: 1)moisture will be in place when these troughs eject into the Plains and 2)with how active the Pacific jet stream is right now and the depth of the troughs these models show digging into the western states this weekend into next week, there will be severe storm setups somewhere across the southern Plains in the Oct 22-28 period. With some luck one or two of these setups will be chaseable and have tornado potential. But, we’ll see…it’s early. For now, it’s just nice to have the potential for some good setups with an active weather pattern. After weakening considerably over the Philippines yesterday, Typhoon 15W has re-emerged over the warm waters of the South China Sea and strengthened. Maximum sustained winds have increased to 100 knots. In the Atlantic Ocean, this would be strong enough to be classified as a category 3 hurricane. 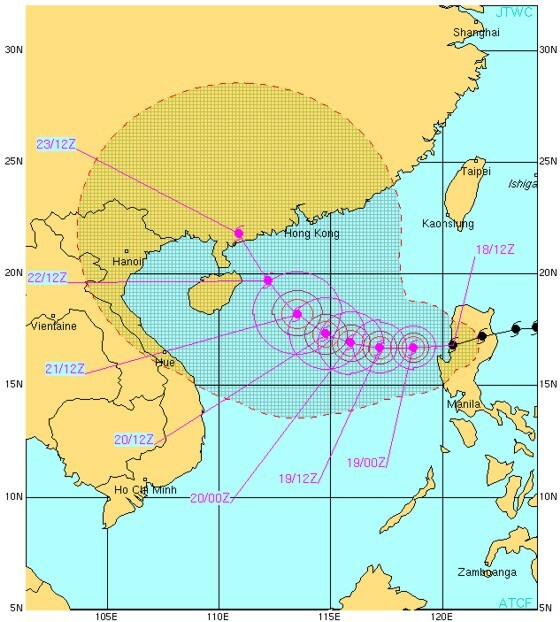 The track forecast from the JTWC has shifted further to the right, and now takes this dangerous typhoon directly over Hong Kong early on the morning of October 23. The forecast shift is the result of computer models showing a stronger trough digging into southeast China over the next two to three days. This will pull the typhoon further north than previously expected. The only potential good news is the cooler waters close to the coast of China will cause some weakening right before landfall. The official forecast brings maximum sustained winds down to 105 knots just before landfall over Hong Kong. - Maximum sustained winds 155 knots! 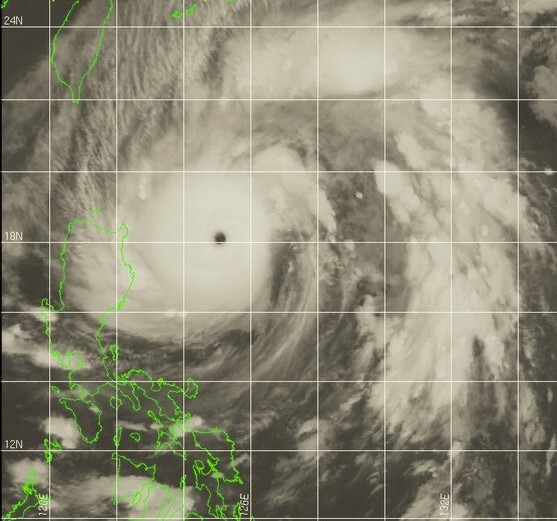 At the time of the satellite image above, Super Typhoon 15W (MEGI) had a measured surface wind gust of 200 mph with a central pressure of 893 mb!!! This storm is a beast. 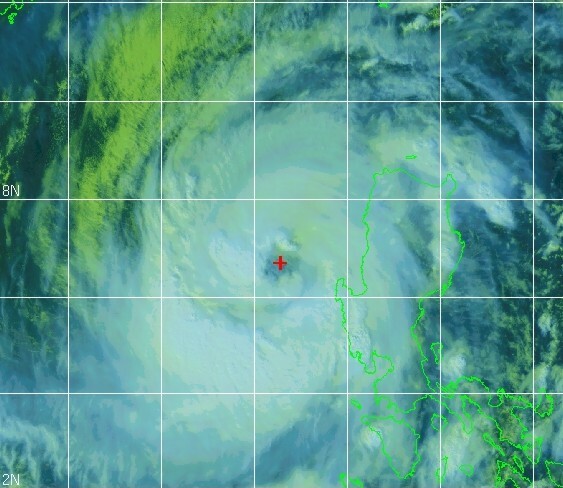 It just hit the Philippines with maximum sustained winds around 155 knots, but has now weakened to 105 knots after moving over land. The typhoon is forecast to move over the warm waters of the South China Sea and re-strengthen over the next couple days. 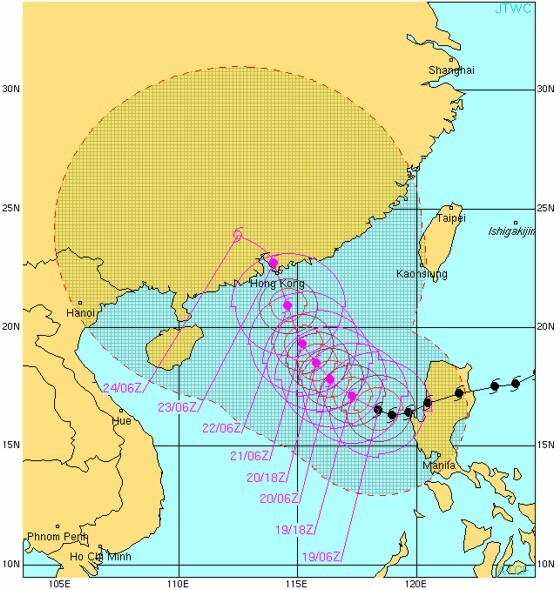 It is expected to make landfall over south China, possibly close to Hong Kong. But, it is forecast to weaken shortly before making landfall as it moves over cooler waters along the south China coast. This is certainly good news for residents in and around Hong Kong. More information about this dangerous typhoon can be found at the JTWC (Joint Typhoon Warning Center) website. A tropical disturbance in the western Caribbean gained enough organization yesterday afternoon to be declared Tropical Storm Paula. The tropical storm intensified quickly overnight and was upgraded to a minimal hurricane this morning. Currently, maximum sustained winds are 75 mph and Hurricane Paula is moving slowly to the north-northwest at 10 mph. Some strengthening is expected over the next day or two as Paula moves over some very warm waters. However, a deep trough located over the central U.S. is moving eastward and will turn Paula to the north and east along with providing increased the wind shear. This shear is going to cause Paula to begin weakening over the next two to three days and beyond. Thus, the official forecast calls for Hurricane Paula to weaken back to a tropical storm by the end of the week. Beyond that, it’s difficult to say exactly where this storm will go. It could hang around the northern Caribbean for a few days before the next series of troughs lift it northeast towards Cuba, south Florida or the Bahamas. On the other hand, Paula could dissipate completely — being ripped apart by the strong wind shear associated with the trough itself. I could also see Paula being lifted northeast quickly this weekend by the current trough, brushing south Florida as a tropical storm. So yeah, the track forecast details beyond the end of this week are not clear by any means. But I don’t think residents in south Florida or even the Keys have much to worry about. Heavy rains may be their biggest concern should Paula track over those regions. The Gulf of Mexico is in the clear as the weather pattern favors continued troughs over the eastern U.S. for the next tens days and beyond. The conference was a success. 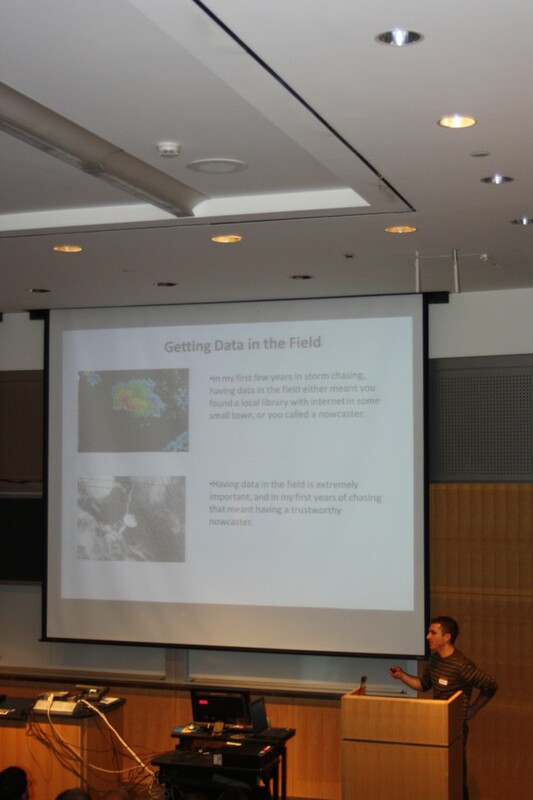 My presentation about storm chasing and how it has changed over the last ten years was well received by the audience. 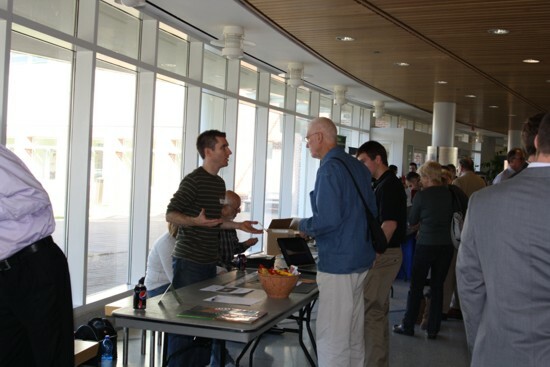 During each break I was overwhelmed with number of people who waited in line to speak with me and ask me questions about storm chasing, Stormgasm.com, and even share their severe weather stories with me. 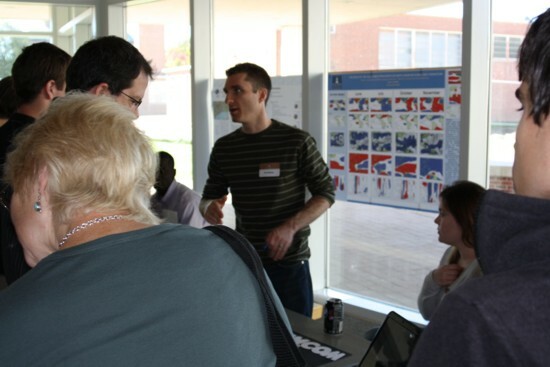 I’m glad I was there to share my experiences with them. 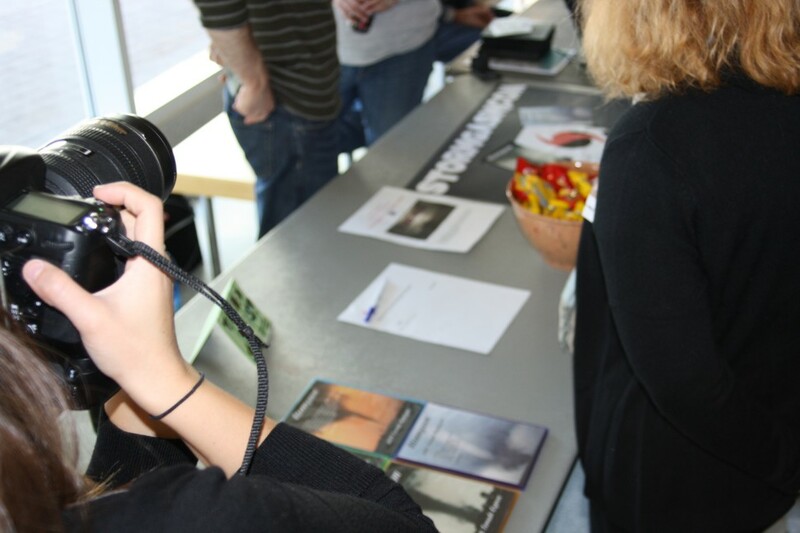 Some people even took advantage of the tornado DVDs we had for sale at the booth. It was a great conference and I want to say thank you to everyone who shared their thoughts with me at the Stormgasm booth, and a special thanks to those who purchased tornado DVDs. Below are just a few photos from the conference, taken by Rick Burriesci. Jim Bishop speaking. Photo by Rick Burriesci. 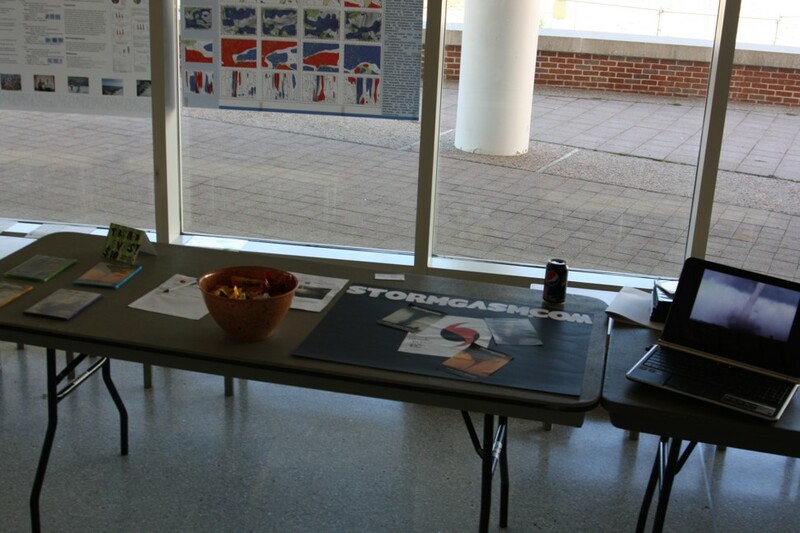 The Stormgasm booth. Photo by Rick Burriesci. 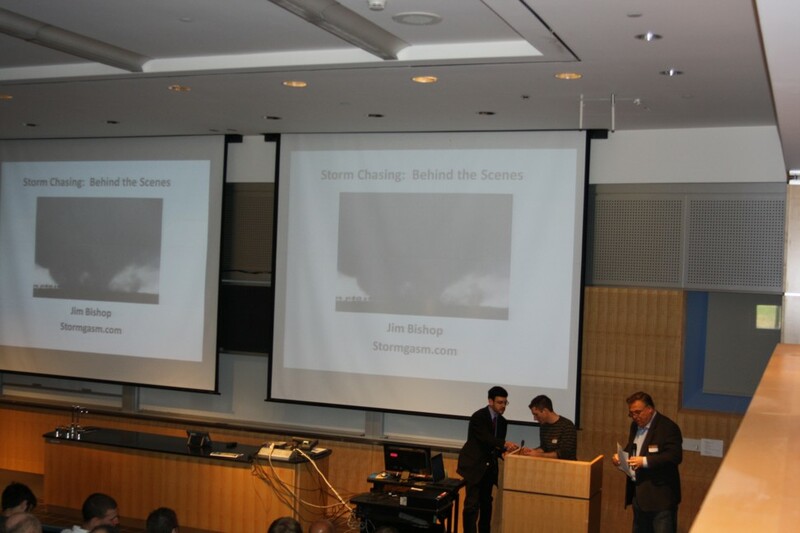 Jim Bishop will be speaking at this year’s Tri-State Weather Conference on October 9 in Danbury, CT at Western Connecticut State University. Jim will talk about storm chasing — what it’s like to chase in the Great Plains every spring, and how technology has changed the hobby since he started chasing back in 1999. He will also share a couple minutes of storm chasing video to show just how crowded and dangerous it can be on the road near a tornado. He and his wife, MaryLeigh, will be seated at the Stormgasm.com booth after the presentation. Any questions that anyone should have about storm chasing can be addressed then. Stormgasm.com tornado DVDs will also be available for purchase. 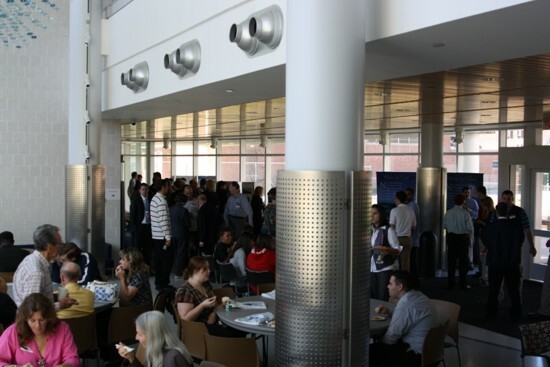 The Third Tri-State Weather Conference will be held from 8am to 5pm on Saturday, October 9th 2010 in the Science Building on the mid-town campus of Western Connecticut State University in Danbury, CT. 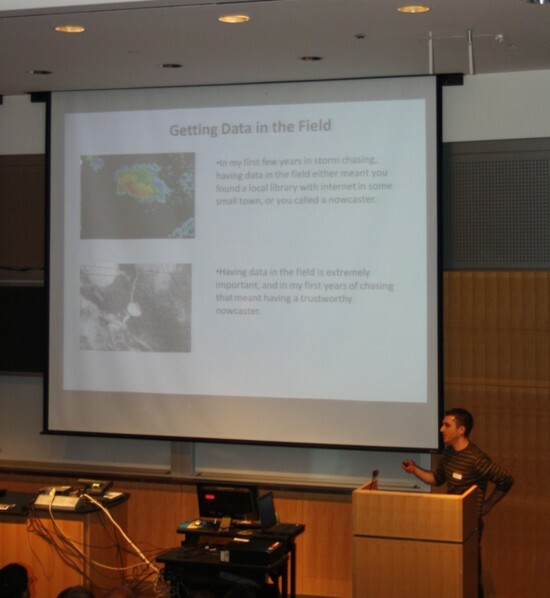 The conference is presented by the Meteorology Program at Western Connecticut State University and co-sponsored by the WestConn Student Chapter of the AMS, the New York City/Long Island Chapter of the AMS, NOAA/National Weather Service/Taunton/BOS, MA, NOAA/National Weather Service/Upton/NYC, NY. The purpose of the conference is to enhance education, professional development and communication among private and public sector meteorologists, researchers, educators, students, emergency management officials, and weather enthusiasts. 4:15 Matthew Scalora and Jeffrey Tongue — The 13-14 March 2010 High Wind Event.